Been dealt the devastating blow that your dream venue is booked for your wedding day? Or your top pick is way over budget? Might be time to consider an Airbnb. Here’s why we’re favouring the at-home happily ever after. You’ll be booking your pre-wedding glam rooms, event space and accommodation in one budget-happy hit. And if you’re not planning on a big wedding, your Airbnb can also double as accommodation for your nearest and dearest after the I dos. You’re booking someone’s home, not a blank canvas. It’s been lived in, loved and comes with all the creature comforts ready to be enjoyed. Need a picnic rug for your sunset shoot, or didn’t bring a corkscrew? Don’t worry - you’re right at home. It’s ideal for international I dos. Eyeing off a fairytale country estate in Tuscany, a chateau in Paris or a clifftop villa in Nusa Dua? We like your style. (And, um, do you need a wedding photographer?) Chances are you can’t drop in for a walk-through of the property, so the Airbnb review system comes in extra handy for a helpful overview. Be sure to read about other couples’ experiences before committing. It sets your personalised scene. You’re not hiring the hall or the hotel that’s been used a million times. You get to find the fit right for your love story. Water babies can book their special clifftop spot on the coast and adventurous folk can secure their dream destination in the mountains. Design your day, your way. We’ve witnessed it work perfectly. We were lucky enough to see the magic firsthand when Tahnya and Evan held their wedding at an Airbnb. It was hands down one of the best days we’ve had the privilege of shooting. 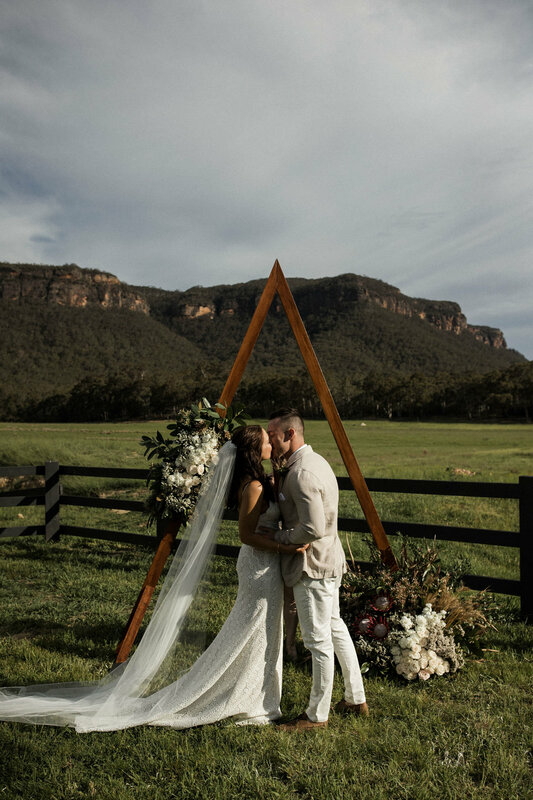 They chose the sweetest house nestled at the base of the Blue Mountains and tied the knot in front of 10 of their nearest and dearest. It was simple, stylish and exuded nothing but love from everyone in the rented room. Check it out here. Find out early on whether the Airbnb allows events. Under amenities, tick the ‘suitable for events’ box to reduce your search to available venues. Once you’ve found the one, contact your host directly and discuss your plans. It’s their house, after all, so it’s best to be totally transparent. Be sure to ask about any additional fees for weddings. Check logistics. Do they have enough chairs or will you need to rent more? Is the kitchen big enough to prepare food or should the caterer do that off-site? Do they know of any other Airbnbs close by to accommodate your guests? Ask your host if they can provide any services that will save you time. Their property may be popular with weddings and they might be able to point you in the direction of local vendors. You can find this epic Blue Mountains Airbnb here.